Upfront > d i v e r s i t y w o m a n . c o m Fa l l 2 0 1 4 D I V E R S I T Y W O M A N 21 Young Entrepreneur: Kathryn Minshew Tapping Her Inner Muse Next I n 2010, K athryn Minshew, a young business analyst at McKinsey & Company, was ready to move on. She began search- ing for a job on a number of online job search sites—and was appalled. "I was foored by how little the user experience had changed in the previous 5 or 10 years," says Minshew, now 28. "I remember searching for business strategy jobs and being told that I should consider a job as an assistant store manager at a 7-11 in Secaucus, New Jersey. And most of the jobs listed were just a title, a logo, and a description of responsibilities. It didn't feel like it matched up with the current state of the market, which is a load of very talented people who have a lot of options." A switch was fipped, and Min- shew became determined to launch a career search site that refected the reality of both the business landscape and the user experience of young, skilled, tech-savvy job seekers. 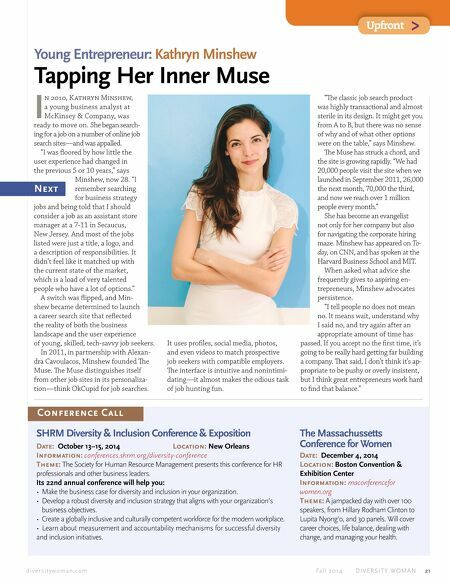 In 2011, in partnership with Alexan- dra Cavoulacos, Minshew founded Te Muse. Te Muse distinguishes itself from other job sites in its personaliza- tion—think OkCupid for job searches. It uses profles, social media, photos, and even videos to match prospective job seekers with compatible employers. Te interface is intuitive and nonintimi- dating—it almost makes the odious task of job hunting fun. "Te classic job search product was highly transactional and almost sterile in its design. It might get you from A to B, but there was no sense of why and of what other options were on the table," says Minshew. Te Muse has struck a chord, and the site is growing rapidly. "We had 20,000 people visit the site when we launched in September 2011, 26,000 the next month, 70,000 the third, and now we reach over 1 million people every month." She has become an evangelist not only for her company but also for navigating the corporate hiring maze. Minshew has appeared on To- day, on CNN, and has spoken at the Harvard Business School and MIT. When asked what advice she frequently gives to aspiring en- trepreneurs, Minshew advocates persistence. "I tell people no does not mean no. It means wait, understand why I said no, and try again after an appropriate amount of time has passed. If you accept no the frst time, it's going to be really hard getting far building a company. Tat said, I don't think it's ap- propriate to be pushy or overly insistent, but I think great entrepreneurs work hard to fnd that balance." Conference Call The Massachussetts Conference for Women Date: December 4, 2014 Location: Boston Convention & Exhibition Center Information: maconferencefor women.org Theme: A jampacked day with over 100 speakers, from Hillary Rodham Clinton to Lupita Nyong'o, and 30 panels. Will cover career choices, life balance, dealing with change, and managing your health. SHRM Diversity & Inclusion Conference & Exposition Date: October 13–15, 2014 Location: New Orleans Information: conferences.shrm.org/diversity-conference Theme: The Society for Human Resource Management presents this conference for HR professionals and other business leaders. Its 22nd annual conference will help you: • Make the business case for diversity and inclusion in your organization. • Develop a robust diversity and inclusion strategy that aligns with your organization's business objectives. • Create a globally inclusive and culturally competent workforce for the modern workplace. 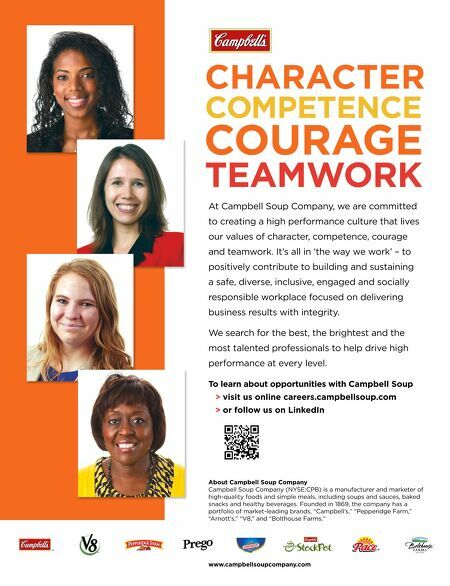 • Learn about measurement and accountability mechanisms for successful diversity and inclusion initiatives.